Sunday, January 25, 2015 – Project TenFourteen: Concert #2 – The second TenFourteen concert included the World Premiere of Polish composer Agata Zubel‘s where to as well as the World Premiere of Slow Portraits 3 by Du Yun. 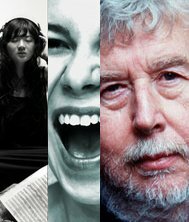 Also on the program, two works by Harrison Birtwistle: The Axe Manual and Gigue Machine. Special guest pianist Nicholas Hodges joined the SFCMP ensemble and Steven Schick on percussion at Cal Performances Hertz Hall in Berkeley.